Did y'all have a fabulously wonderful Thanksgiving? I hope so. Here are some "Motivational" posters that might put a little smile on your face during Black Friday. If you follow the SheppyBrew Brewery Facebook page, you might have already seen them, but I think they are even better together like this. One thing is for sure ... you won't see me at the malls today. A couple weeks ago, I mentioned that I stopped by a tiny little brewery called Saint Patrick's Brewing Company. I do not think I mentioned that I brought home a bomber of their Saison, but I did. I really liked this beer at the "tap" room and wanted to bring one home to enjoy. Then, I opened and poured the bomber a couple weekends ago. 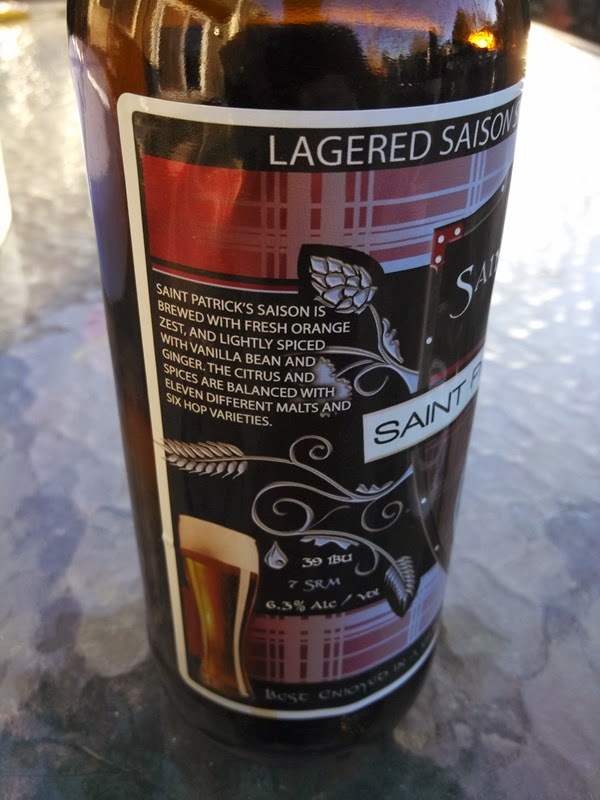 The bottle says it is brewed with fresh orange zest, and lightly spiced with vanilla bean and ginger. The citrus and spices are balanced by 11 different malts and six hop varieties. It has 39 IBU. Its SRM is 7,and its ABV is 6.3%. It has only been about a month since I've done a report on my untappd badges, and I already have enough new ones that it is time to do another. Most of these are simply new levels of badges I've previously earned. I brewed Eric's Irish Red on Sunday. With all the attention I've been paying to new styles (see BJCP goal), I have really not brewed a lot of my old favorites this year. Since all I have left is Category 12 Porter and Category 19 Strong Ale to finish up before the end of the year, I though now would be a good time to brew one of the SheppyBrew flagships. Eric's Red is one of those recipes that has been around since my Mr. Beer days. It has obviously changed quite a bit over that time, but I really like the all-grain rendition that I have come up with, and the only difference between this time and last time is the yeast selection. This time I used London Ale Yeast harvested from Jolly Morlock Porter, just because the timing was right. Every once and awhile I'll come across on of those "(De) Motivational Posters" on the internet that amuse me. If you follow the SheppyBrew Brewery Facebook page, you'll see me post them from time-to-time. If you have not already, PLEASE go like the SheppyBrew Brewery Facebook page. Anyway, it has been awhile since I've assembled these in a blog post, so I thought I would do that today. Let me know if you find these amusing as well by leaving a comment below or on the SheppyBrew Brewery Facebook page. On my way home from work yesterday, I decided to stop by a tiny little brewery called Saint Patrick's Brewing Company. You may remember that the Beer Model and I came across them at this year's GABF Friday session. They are right on my way home from work. In fact they are right along one of the bike paths I take when I bike to work. I have never been to them because their tap room hours were pretty inconvenient for me. They just recently added Friday night, and last night I decided to stop in. Anyway, I walked into their tiny little tasting room last night, and asked the guys behind the counter if I could try some of their beers. "What kind of beer do you like to drink?" If you know me at all, you probably can guess basically what my answer was. Turns out that "pretty much everything" is what they had, so that was good. Until about mid-week I was not planning on brewing today. Between it being the end of Daylight Savings time (giving me an extra brewing hour) and there being no Bears or Broncos football games, I thought it was just too opportune a day not to do it, though. Plus, yesterday was the AHA's Learn to Homebrew Day. I can't not brew on the weekend of Learn to Homebrew Day, can I? So, I quickly put together a porter recipe. As many of you know, one of my 2013 goals was to round out my brewing experience, by making sure I had brewed at least one all-grain batch of all 23 BJCP beer categories (see SheppyBrew Styles). At the beginning of the year, I had brewed just over half, so brewing 11 was not that big of an undertaking. All I had left as of this morning was Category 12 Porter and Category 19 Strong Ale. Now, I only have the Strong Ale left. 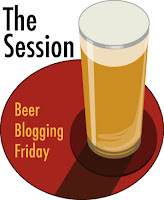 I have not done a post for "The Session" (aka Beer Blogging Friday) since May. Not sure why. Just have not been into it. I did just tell myself that I should get back into the habit. November's topic sneaked up on me, but it just seemed too good to pass up. This month, November, the topic comes from Nicole (aka Nitch), who does a beer blog called "Tasting Nitch". Her topic is "Women and Beer: Scary Beer Feminists or a Healthy Growing Demographic?" You can read all about it at: The Session #81 Announcement- Scary Beer Feminists! "Feel free to write about what you want as long as it is beer and woman related!" I like women. I like beer. This seems like the perfect topic to get back into the habit of participating in "The Session". October had a very strong mid-month. Thank you #GABF. For awhile it looked like it would blow away August, but it was a very lack-luster end of the month. October still has the new page-view record, but just barely. I hope November picks up from the end of October.